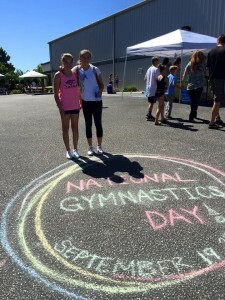 CCG is celebrating National Gymnastics Day! 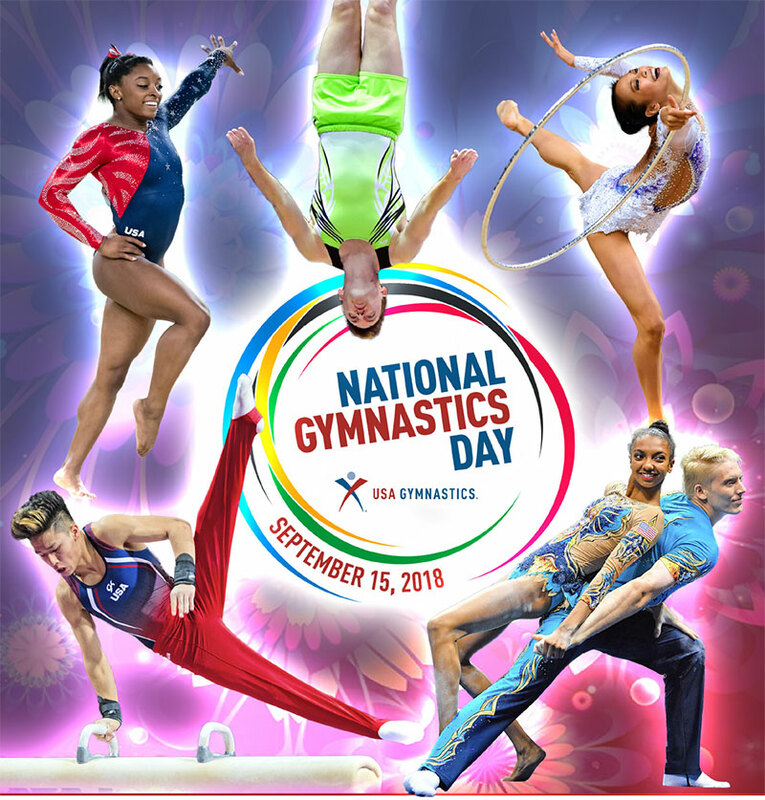 All gymnasts, coaches, and CCG fans are invited to celebrate our sports with USA Gymnastics! Free food & beverages, goodie bags, and giveaways are available while supplies last. 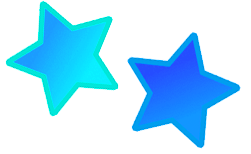 Important NOTE: The FREE clinics are for children ages 8 months to 15 years of age. You will be able to sign up for the FREE clinic’s beginning September 5th (in Gym 1). Call (805)549-8408, stop by the Gym 1 office, or email info@iflipforCCG.com! Make sure you get your NGD Bingo Booth Card checked off on all boxes starting with the check in booth where you get your NGD Goodie BAG!! Welcome & Check In Booth Opens at 12:45 pm, get there early! 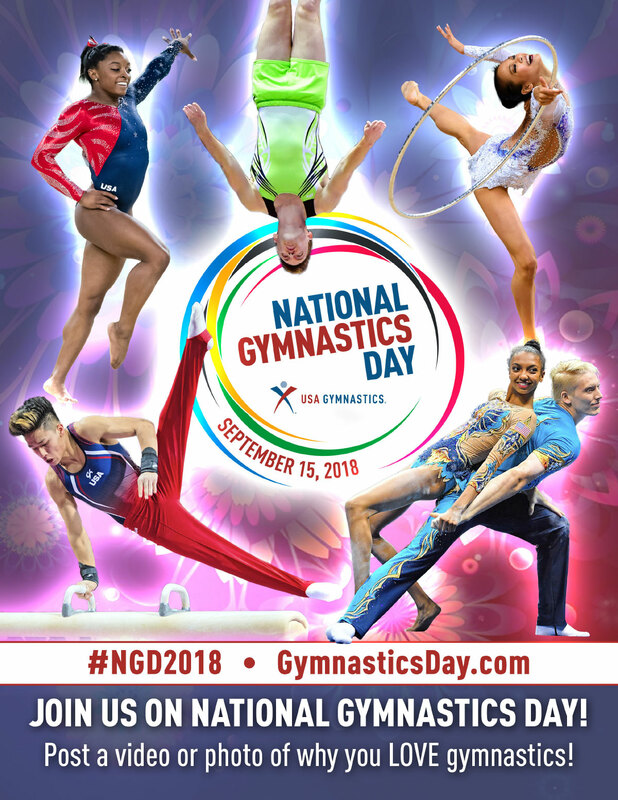 Free NGD Hot Dogs, Chips, & Drinks Booth! Test your talents at the Toss-n-win Booth! 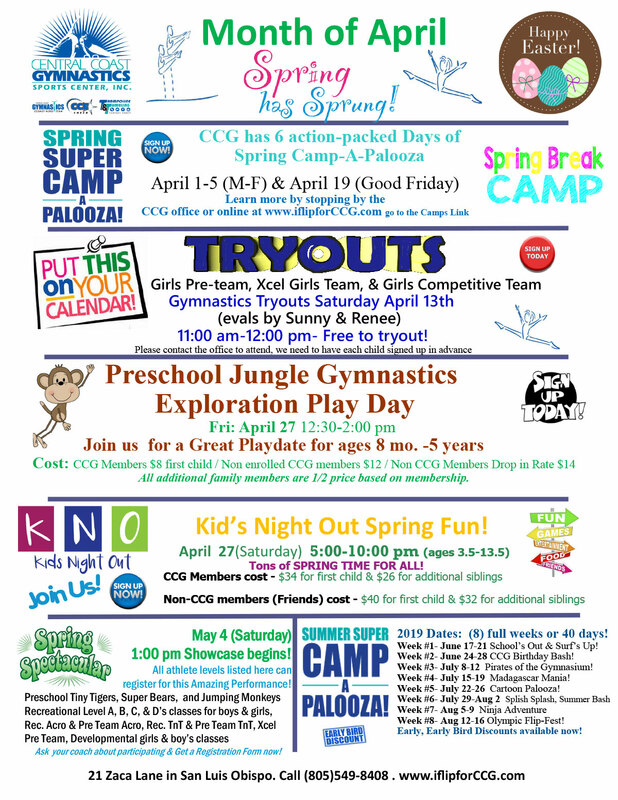 Concur the Ninja Course, learn to bounce, tumble, and much more! 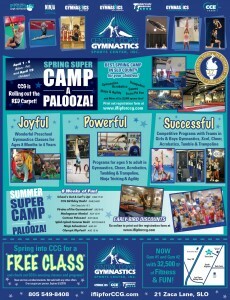 CCG Spin the Wheel Prize Booth at the Main Office inside Gym #1 (turn in your bingo card here). Amazing Vendors joining us are Great local companies like Lindamood Bell Learning Academy, Dream Dinners, Aloette Skin Care, UCP of SLO, Custom Fit Personal Training, Central Coast Autism Center, and more coming. 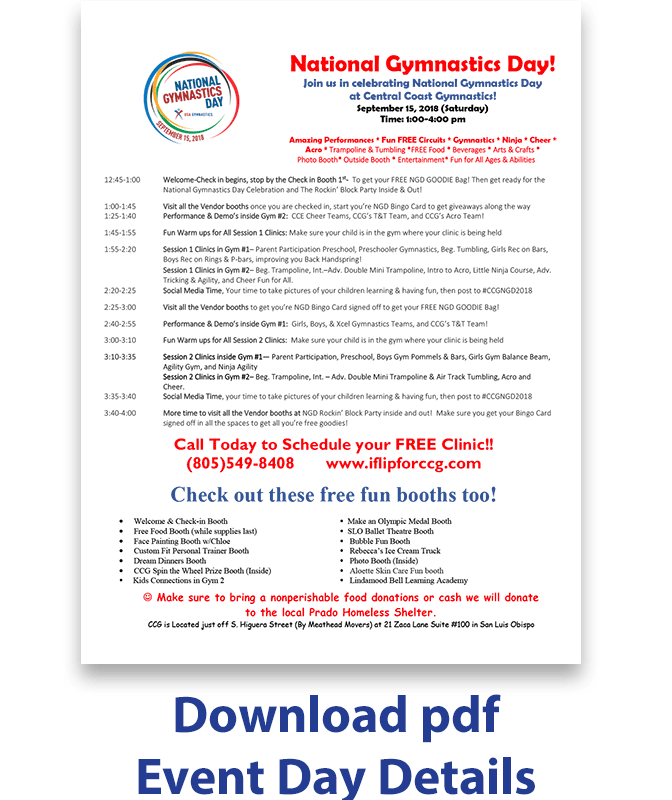 Everyone will get an NGD Bingo card, so you make sure to visit all the booths and get information along with free promotional items at each one and check off your NGD Bingo Card at the same time! However spaces in each clinic are limited, so please call, stop by, or email today to join reserve a space in a FREE Clinic. 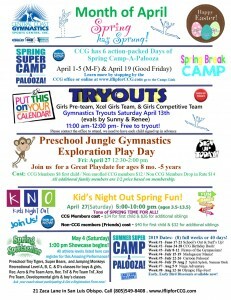 The FREE clinics are for children ages 8 months to 15 years of age. The Schedule of Clinics is filling up fast, please call in advance to sign up at the CCG office in Gym 1 to attend 1 of these before they fill up! We will also list all the vendor booths outside for the Rockin’ Block Party! 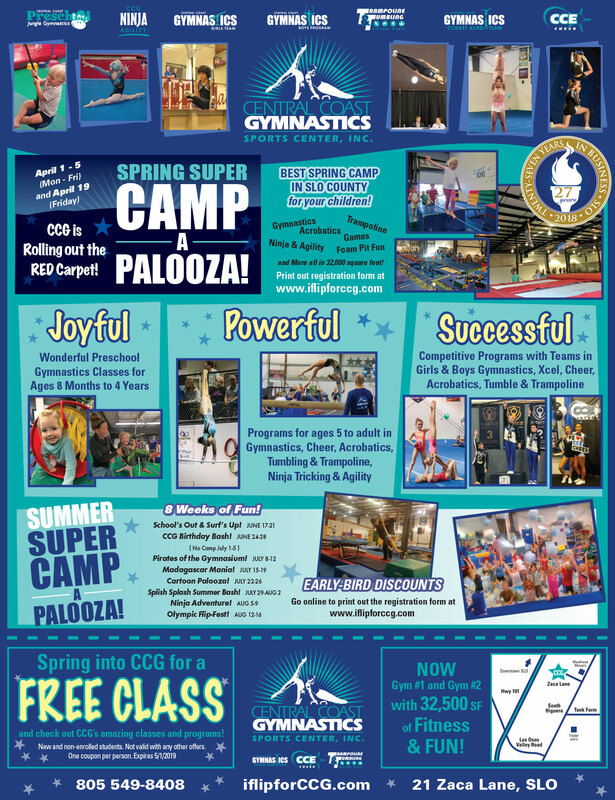 Performances, free clinics to learn new gymnastics skills, try a new discipline, giveaways, and so much more!